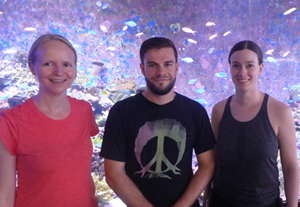 Research Associate, Dr Kate Rawlinson, returned to Australian Institute of Marine Science and the National Sea Simulator facility in September to work with collaborators on the Acropora coral-eating flatworm. A notorious pest among coral hobbyists, it’s perfect camouflage against the coral tissue means that it is easily and inadvertently introduced into reef tanks where it feeds and reproduces happily and destructively - killing off coral colonies quickly. Working with Australian-based scientists, Kate found this polyclad flatworm for the first time in the wild at Lizard Island in the north of the Great Barrier Reef. Since then it has been found at sites all along the 1,400-mile reef system. As well as a problem for coral hobbyists it is now a threat to coral aquarists and biologists who propagate corals for reef restoration efforts and a more sustainable hobby trade. 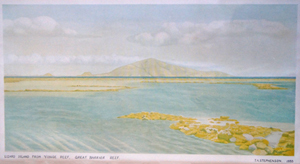 The Department is lucky to have a painting by Dr T A Stephenson entitled “Lizard Island from Yonge Reef”, painted in 1933. Stephenson along with others, including the first woman to be appointed as an academic in the Department, Dr Sidnie Manton, FRS, were part of the Great Barrier Reef Expedition in 1928-29. 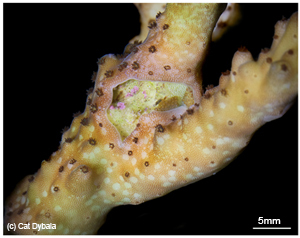 Volume Three of the report shows some wonderful black and white images and detail of the growth of Acropora squamosal (See: https://archive.org/details/scientificreport3193brit/page/n435). Thanks to the Australian Government for investing in the National Sea Simulator, and to the people that run this incredible facility, we are now able to carry out sophisticated experiments to look at the effects of temperature on the life cycle of the AEFW and to identify effective biological and chemical controls. Furthermore the genome of the Acropora-eating flatworm (Amakusaplana acroporae) will be sequenced as part of the Wellcome Trust Sanger Tree of Life programme.